Y’all are just going to have to trust me on this. A little kick and spice in the chili, plus a little sweet from the waffles…a totally party on the plate and on your palate. Also, I thought that I had some shredded cheese in the freezer to add on top of these waffles, but I must have used it all up without realizing their wasn’t another bag in the freezer. Doh. I just added some sliced cheese between the chili and waffles and it was perfectly delicious. Next time I make these, I’ll certainly be topping with sharp cheddar shredded cheese. Also, I’m so glad that I made 2 batches of these waffles. I made a batch with regular flour, as well as a batch with gluten free flour for my gluten-free/gluten-limited little dude. We had plenty leftover with requests to put them into lunchboxes. Win-win. Add all the chili ingredients to 5 qt or larger slow cooker, along with 7 cups of water. Stir together. Set the slow cooker on low and cook for 8 hours. Before dinner, prepare the cornbread waffles by whisking all the waffle ingredients in a mixing bowl. Batter should be thick, but still flow easily off the whisk. Cook the waffles according to manufacturer directions. Makes 6 waffles. Plate the waffles and then top with chili and cheese and any other favorite toppings ~ sour cream, sliced green onions. 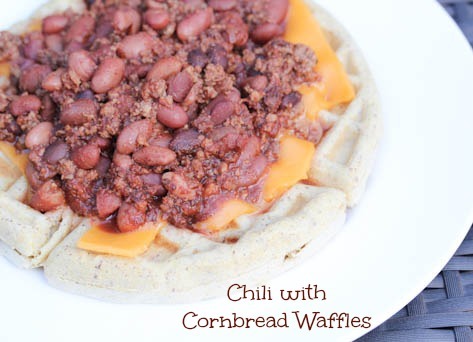 Serve Chili with Cornbread Waffles. This recipe is featured on SouthernPlate.com’s Meal Plan Monday #53.